The first full week of fall has been rather pleasant. High temperatures have been comfortably in the 60’s and 70’s, and we’ve seen nothing but sun all week. Even the winds have been light to almost nonexistent. Thankfully, it has also been much drier; no rainfall has occurred in southern Minnesota since early Saturday morning when we received 0.15 inches here in St. Peter. The next ten days’ forecast looks similarly sweet, with temperatures in the mid- to high 60’s and sun all next week. Our first frost however might appear this weekend, as low temperatures are expected to dip down into the mid-30’s. Last week’s record rains resulted in record flooding for St. Peter. The river apparently crested on Tuesday evening here in town, but only this morning have a couple of the major highways through town been reopened. This past Sunday morning, all roads leading north, east, and south of St. Peter, including state highways 169, 99, and 22, were closed to traffic. That meant that the only way out of town was west, resulting in long detours and sometimes traffic jams on small county roads. Water could be seen rushing over the Highway 22 bridge on the south side of town, and on the north side of town the river completely covered Highway 169, almost flooding the McDonalds and Holiday gas station parking lots on the west side of the road. The highway itself looked more like a waterway than it did a roadway. As of right now Highway 169 north of town and the Highway 99 bridge are still closed, but these routes are expected to reopen this weekend. Several locals who have lived here for decades remember a similar flooding event in the late 1960’s, but it is uncertain at this time if this week’s floods have eclipsed the level of those floods. If this isn’t the record, though, it’s certainly among the top flooding events in St. Peter’s recorded history, and one that won’t likely be seen again for another 50 to 100 years. 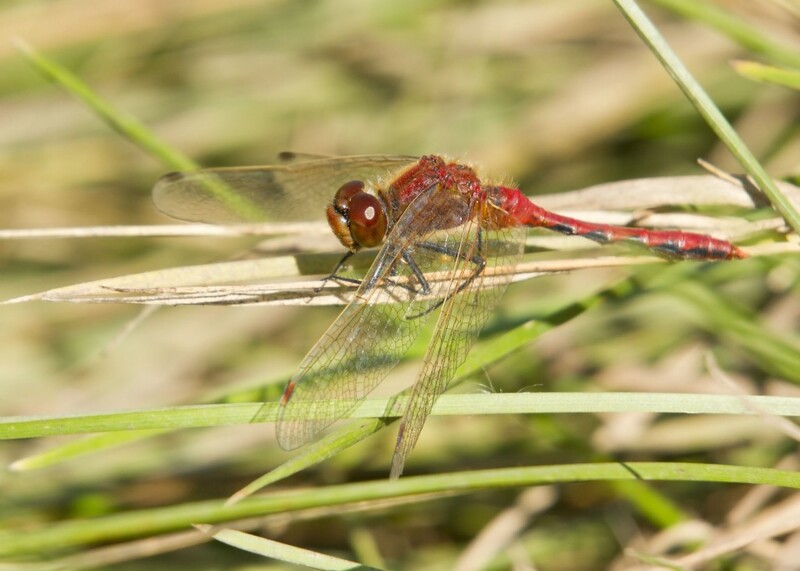 Meadowhawk at rest near Jim Gilbert Teaching Pond, 9/30/10.